Sherpa Tip: Ascend’s eCommerce integration is designed for use with the SmartEtailing website platform. Multi-Store Retailers: Ascend's inventory export options must be configured at all locations, even if all locations do not upload to an eCommerce website. From the Ascend Desktop, click the Options tile. Select the eCommerce Export tab. In the Inventory Export FTP Address field, enter the FTP address from your eCommerce website provider. Do not enter ftp://. 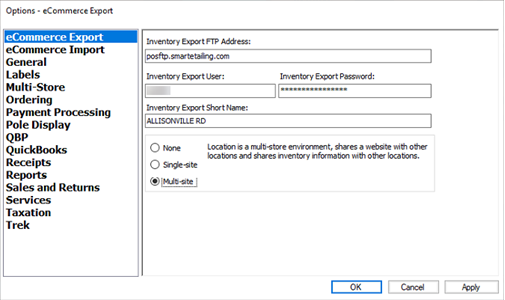 In the Inventory Export User field, enter the user name for your FTP account. In the Inventory Export Password field, enter the password for your FTP account. In the Inventory Export Short Name field, enter the Location Name as specified on your eCommerce website. (Multi-Store Retailers) From Data Upload Options, select the appropriate status for your location. a. None: Select this option if this location does not upload to an eCommerce website. Data from this location is not included in any manual OR automatic uploads. b. Single-Site: Select this option if this location is part of multi-store chain, but uploads to its own, individual eCommerce website. c. Multi-Site: Select this option if this location is part of multi-store chain and all stores in the chain upload data to a single eCommerce website.